An excellent old pear variety. Sweet with perfumed flavour. Raised by M Dion near Guerande, Loire, France from a Doyenne du Comice seedling and introduced by M Bruant of Poitiers in 1895. Large pyriform slightly irregular shaped fruit. Green mostly smooth skin with some russetting. The white flesh is firm and slightly granular but also juicy and melting. It is sweet with a fragrant perfumed flavour. 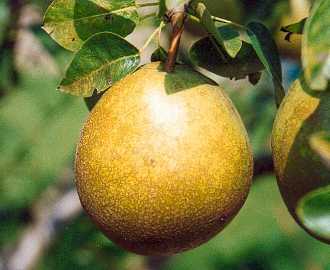 A high quality dessert pear.